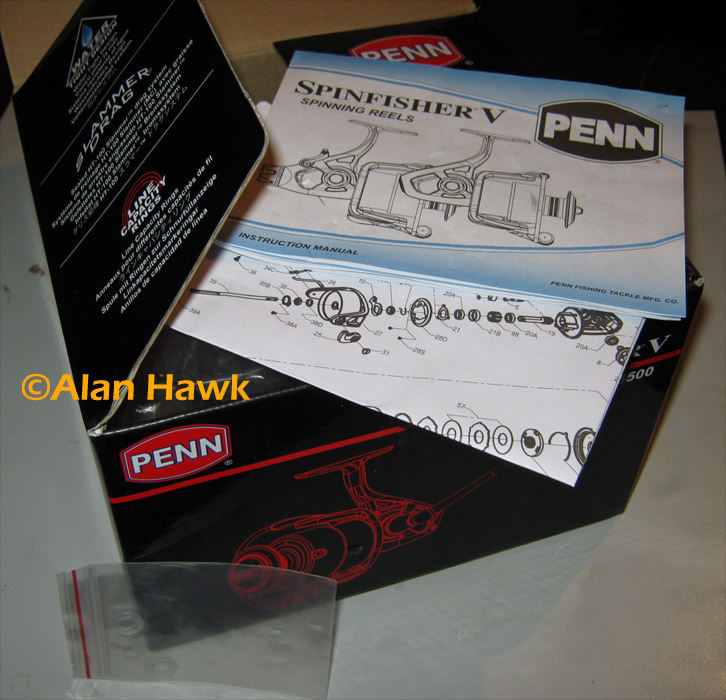 Penn’s Spinfisher V must be one of the most anticipated pieces of fishing equipment in the entire history. Long before it actually went on sale last year specifications were released, features discussed, action clips posted online, and show appearances drew widespread interest. 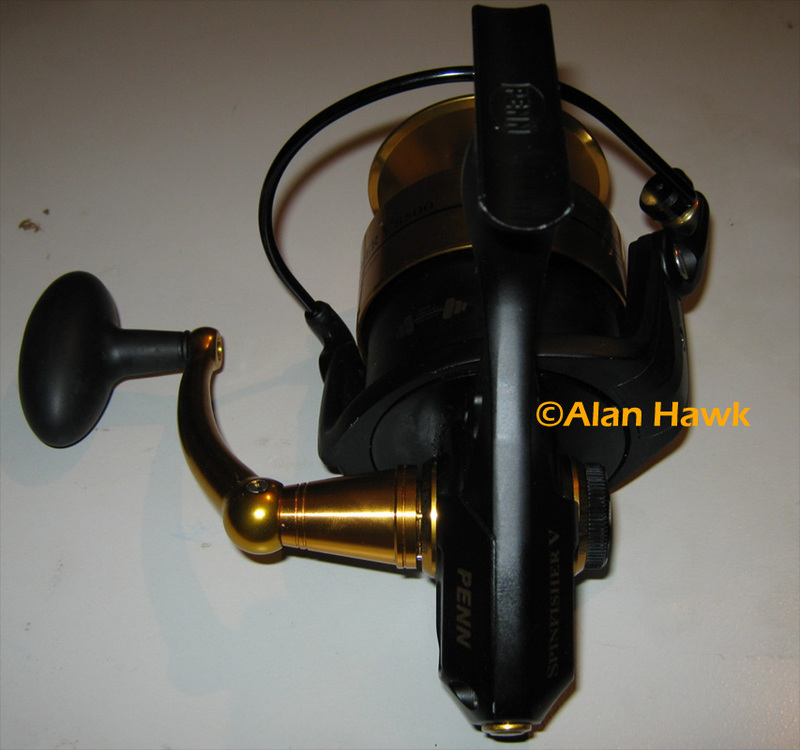 Probably the most remarkable of all were the videos released by Penn of the reel being reeled underwater and catching big Tuna, and since the price ranged from $140 for the 3500 to only $200 for the mammoth 10500, the face of fishing world seemed about to change dramatically. 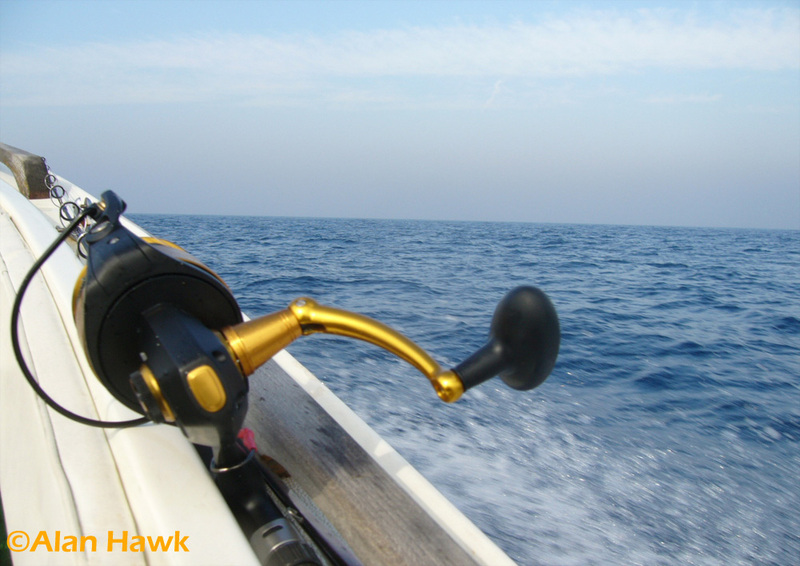 The Spinfisher comes in two styles, regular and live liner. The regular model comes in 4 size classes, each class comprises two reels sharing the same frame but with different spool capacities. The smallest is the 3500/4500 class, then the 5500/6500 class, the 7500/8500 class, and finally the 9500/10500 class. I originally wanted to review either the 9500 or 10500, but since their release kept being postponed I decided to review the 8500. 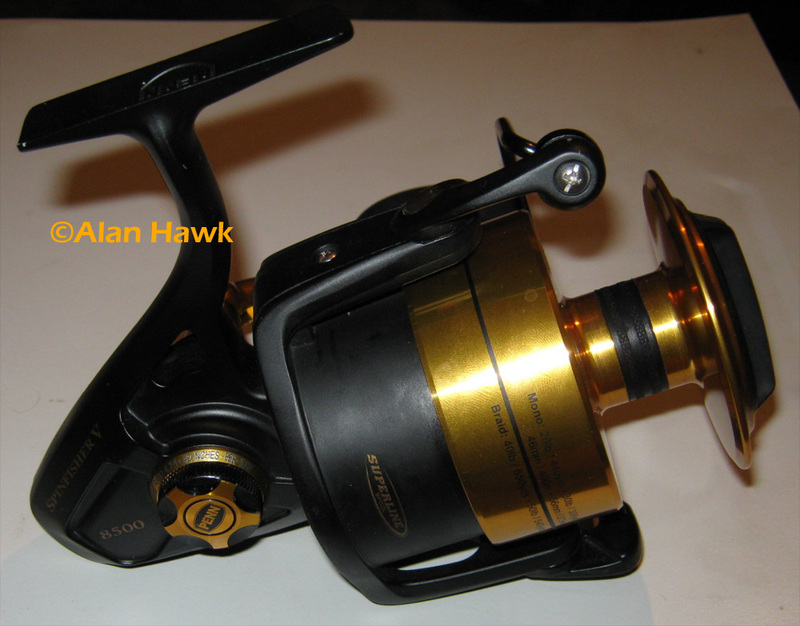 All those reels basically share the same construction and features with a few exceptions, such as sizes from 7500 up having a backup mechanical anti-reverse, and sizes 9500 and 10500 having a main shaft that extends all the way through the body to a rear support in Penn’s classic style. The reel comes with a parts diagram, a manual, and a small bag with extra spool shims to adjust the line lay shape on the spool. It doesn’t come with a reel bag, and I’m thankful for that since reels in this price range usually come with a bag that’s basically a pathetic rag good for absolutely nothing, so thanks Penn for not insulting us with that! But my faithful scale says otherwise. 31.3 oz is 887 grams. 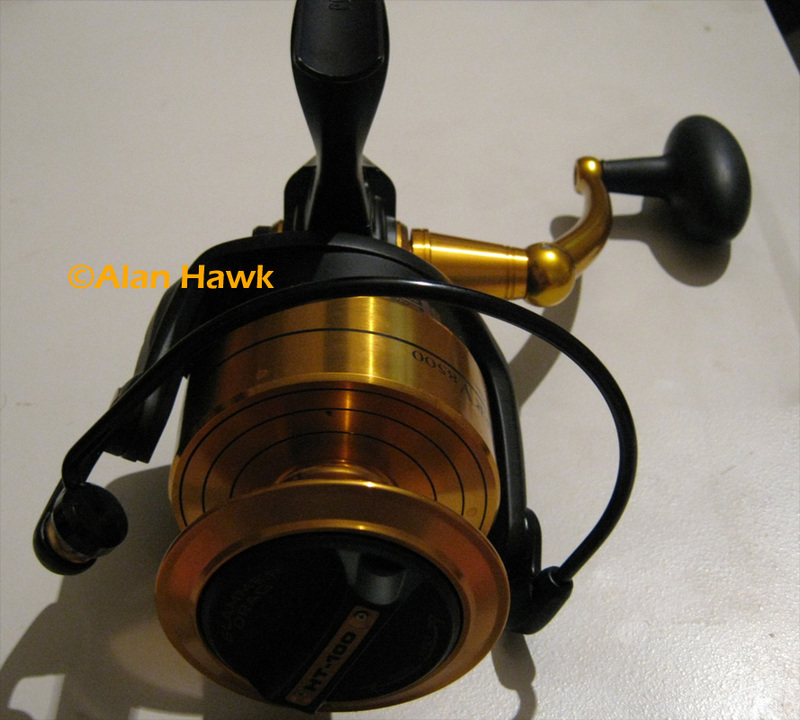 I have rarely seen a reel maker that doesn’t claim lower weights than actual ones, so I’m not faulting them for following this time honoured tradition of the industry. 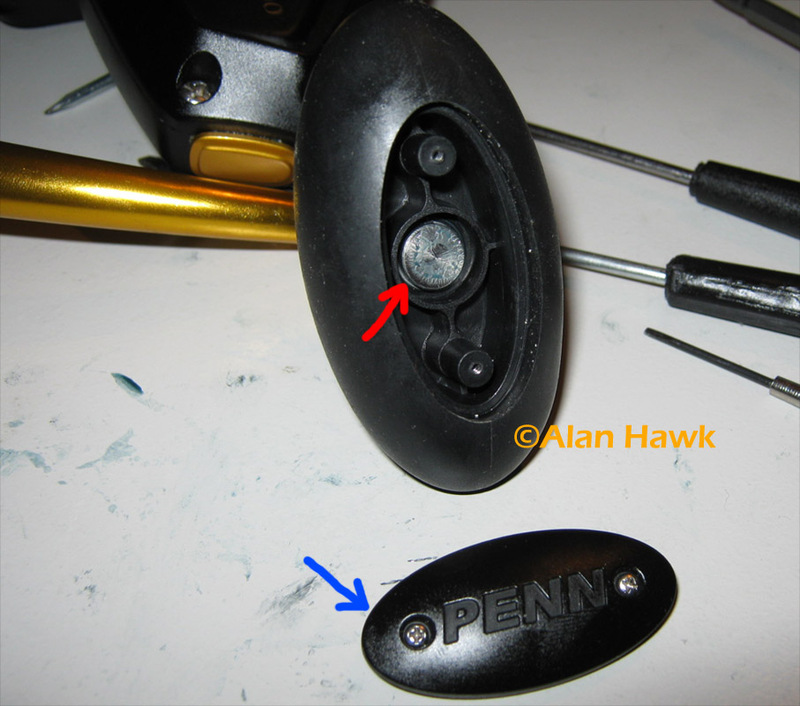 In the above photo you can see Penn’s new feature, the rubber ring on the spool to keep braid from slipping. Well, I’ve tested most non-slip systems out there and had entire spool fillings slips when they didn’t work, but finally this is one system that actually works. The ring is wide enough for the knot to stay on it, then the few following coils of line are clinched by the ring strongly enough to create a hold as reliable as mono backing. 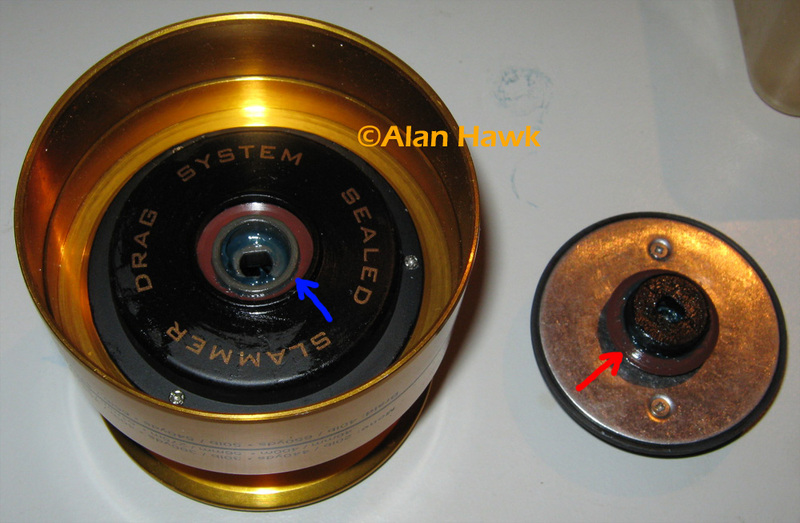 The Spinfisher V has a sealed drag system, with the top stack protected by a seal mounted on the drag knob (red arrow), and the bottom drag unit protected by two seals, one of which is pointed by the blue arrow in the photo above. 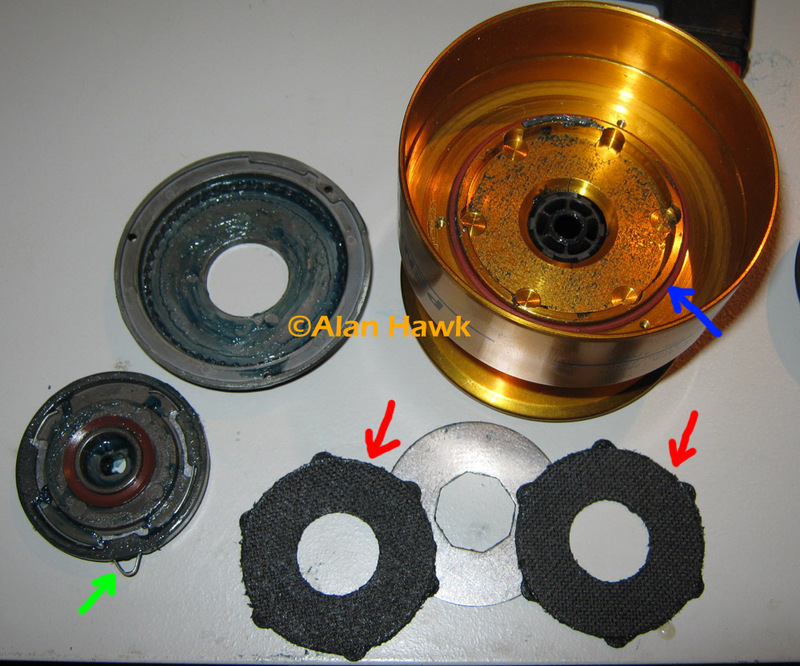 The blue arrow in this photo points the second seal of the bottom drag unit, the green arrow points the very durable and audible drag clicker, and the red arrows point the two large drag washers of the bottom unit. Well, calling the Spinfisher’s drag “outstanding” would be an understatement. This bottom portion has the same arrangement as the one in the 2008 big Stellas with keyed washers utilising both sides of the second washer for braking. 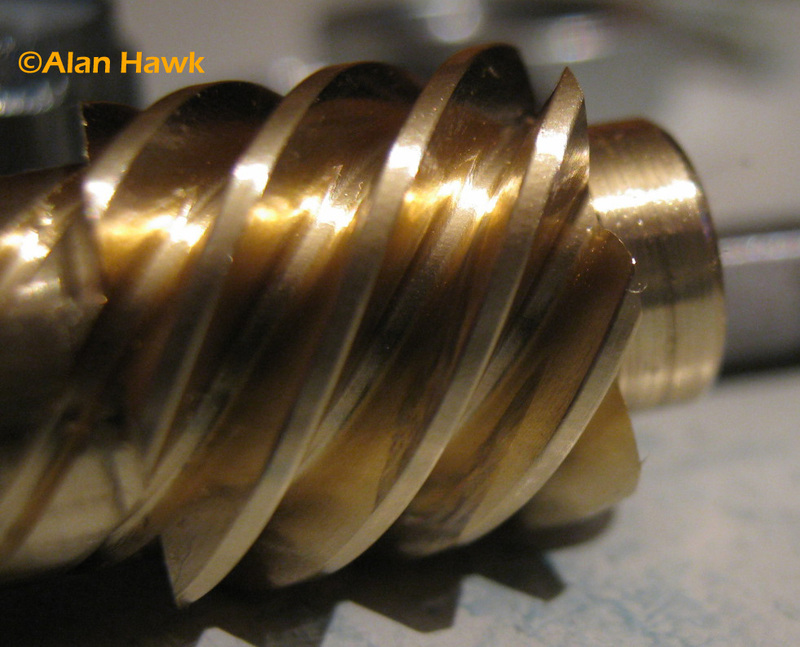 This produces the drag output of three washers using only two, and Penn’s proven drag material just shines. 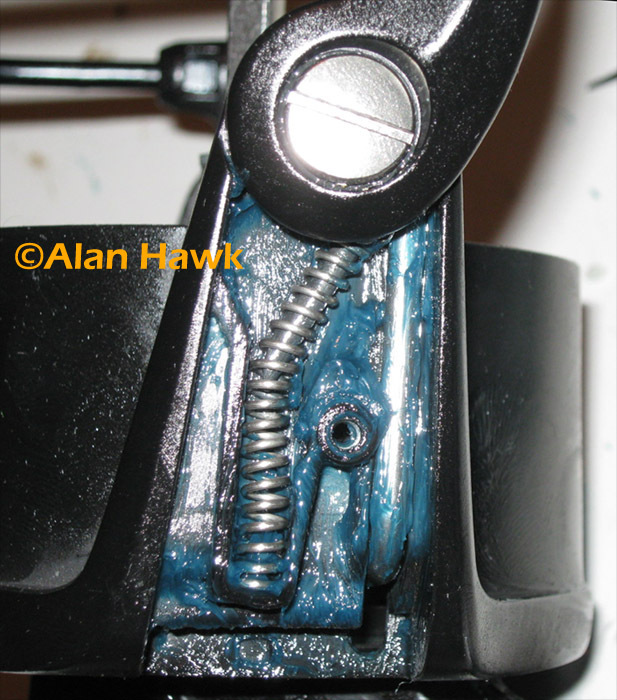 The spool starts smoothly, keeps going steadily, and due to the size and location of the washers the system works stress-free and I didn’t experience any heat build up during my 7 test trips for a total of nearly 60 hours of fishing. The top stack has a single metal washer and a single brake disc that functions more as a spacer than a drag. Virtually all the braking force comes from the bottom drag unit. 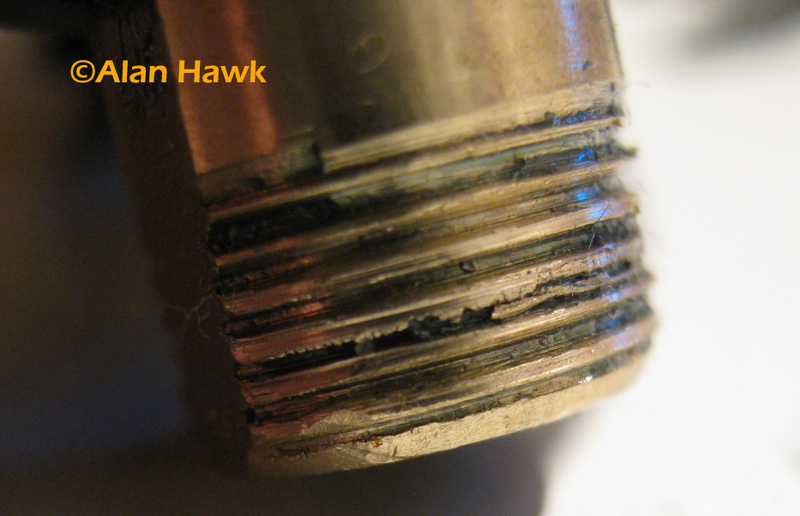 The drag pressure of the Spinfisher V has a very slow progression due to the extremely small threads pitch on the shaft (red arrow). 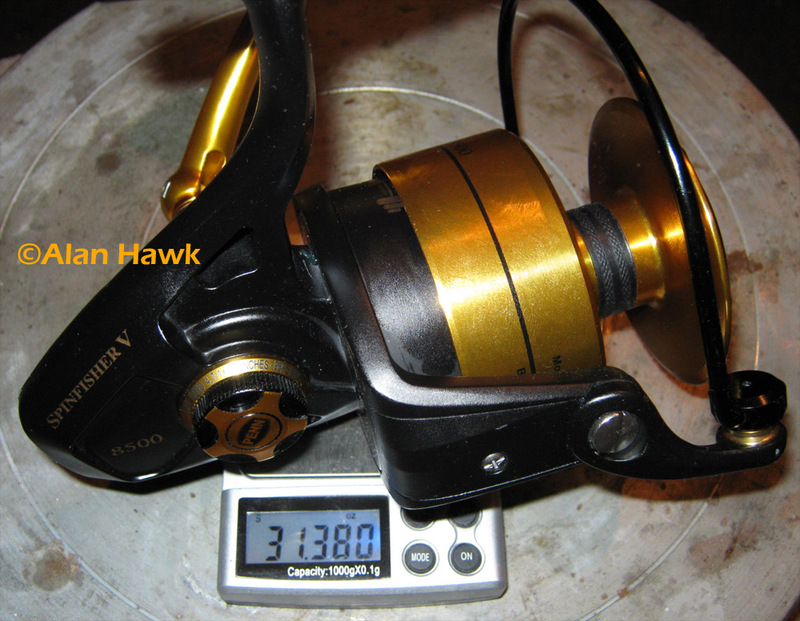 That means that you have to turn it more times than needed on other reels in order to increase the drag pressure by the same amount. Don’t know what to make of that. It’s not really an issue, but it’s quite unusual and it takes a lot of getting used to, then you need some mental resetting when changing to another reel after fishing the Spinfisher for a while. Before we leave the spool, I must mention that the Spinfisher V lays line remarkably even. I don’t think I’ve seen such a beautiful line lay on any reel in this price range or even considerably higher. Penn have perfected the oscillation cycle and the result is very pleasant. The photo above is with the jig 250 feet down lest you think I was underfilling the spool! 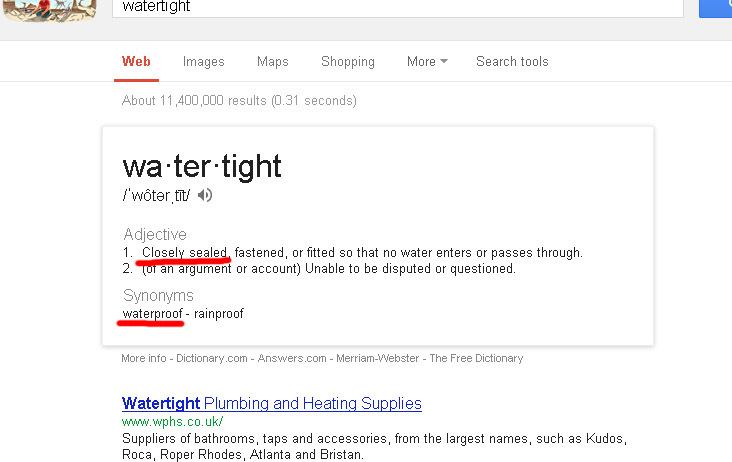 The handle has a mounted seal (red arrow) to keep water out of the body where the handle goes in. 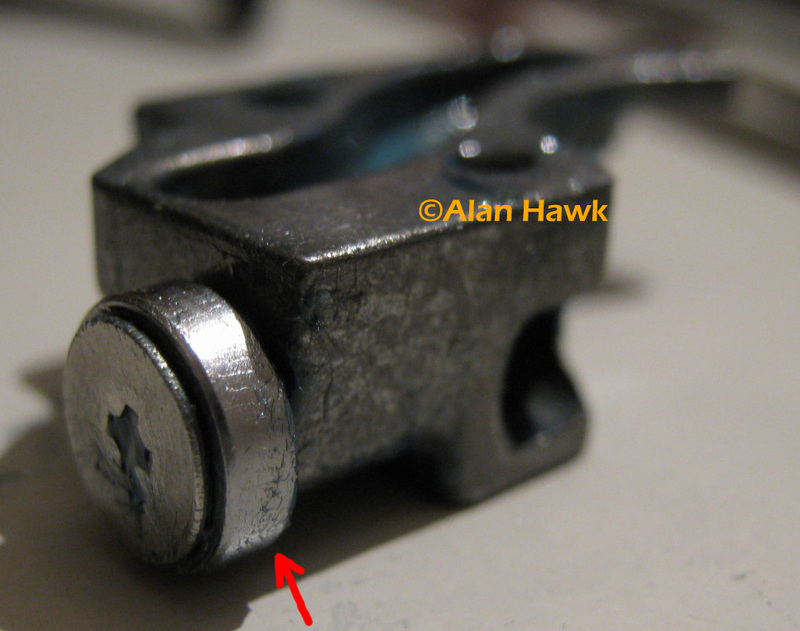 The knob is of a good quality, but unfortunately it’s bolted (red arrow) and can’t be taken apart for cleaning or proper lubrication. 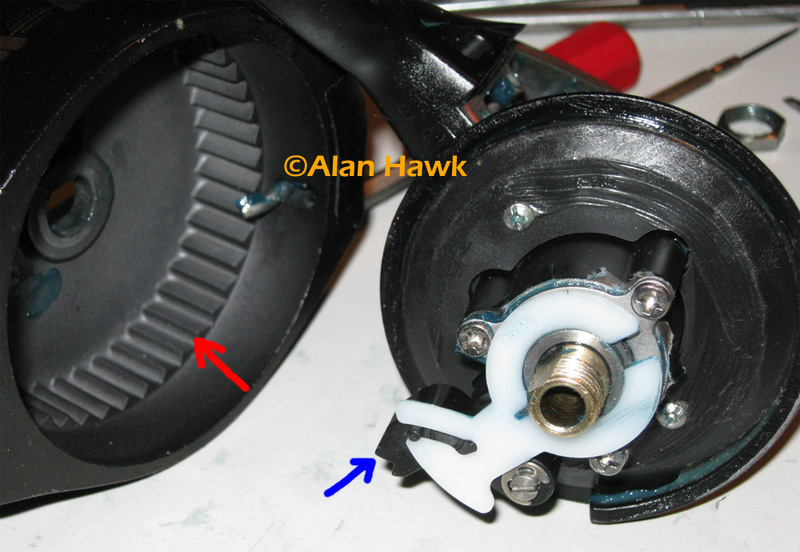 The protective cover though (blue arrow) fits tightly and is held by two screws in a much nicer arrangement than the Torque whose cover is glued. 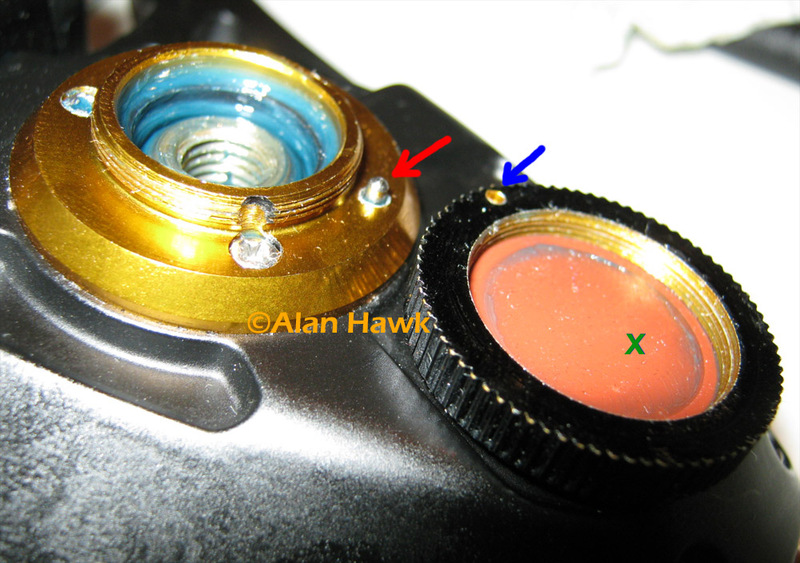 The opposite side is protected by a metal cap with a rubber seal (green X), and there is a nifty little feature where a spring-loaded bolt (red arrow) rises from the housing so that if the cap becomes loose the little bolt would slide into the hole in the cap (blue arrow) to stop it from rotating more and falling off. 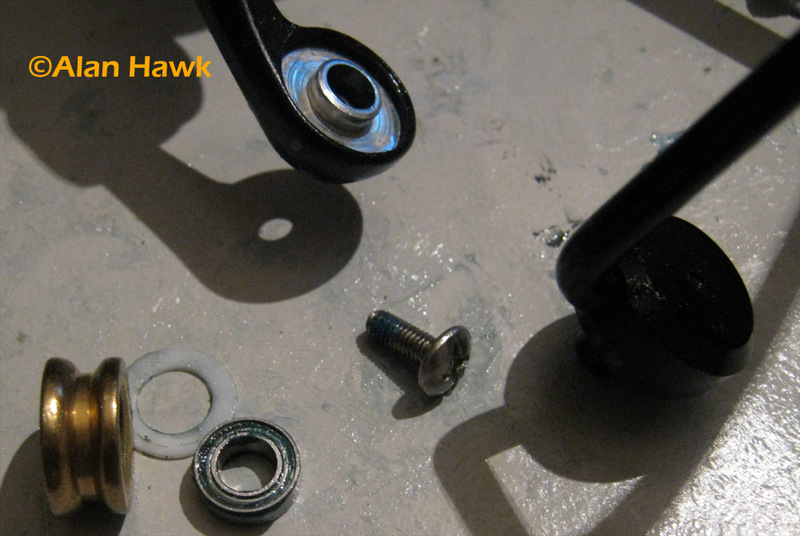 But the nut was held in place by the locking plate unable to turn as shown in the photo above. 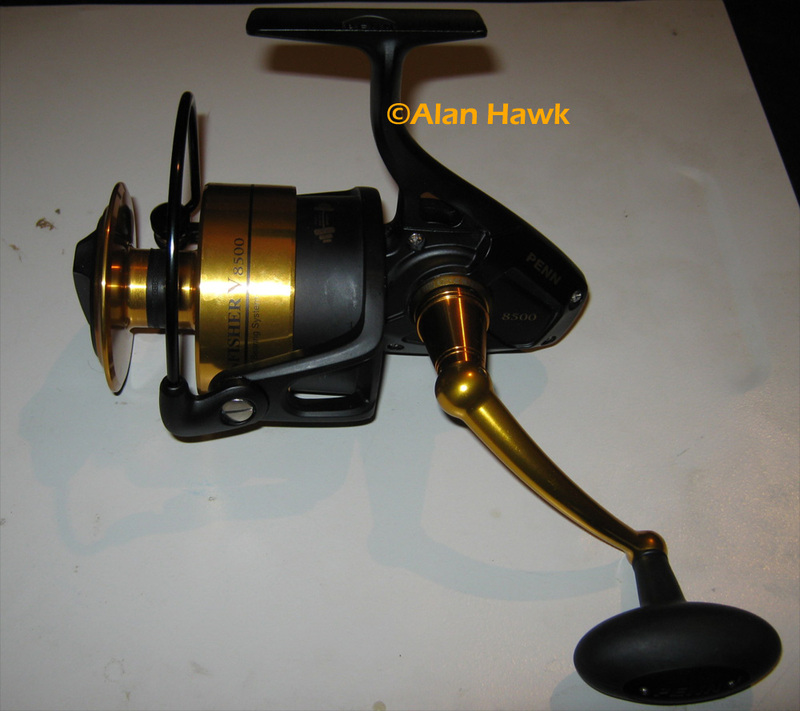 I decided to retire the Spinfisher then and continued the day with another reel and considered the testing finished. 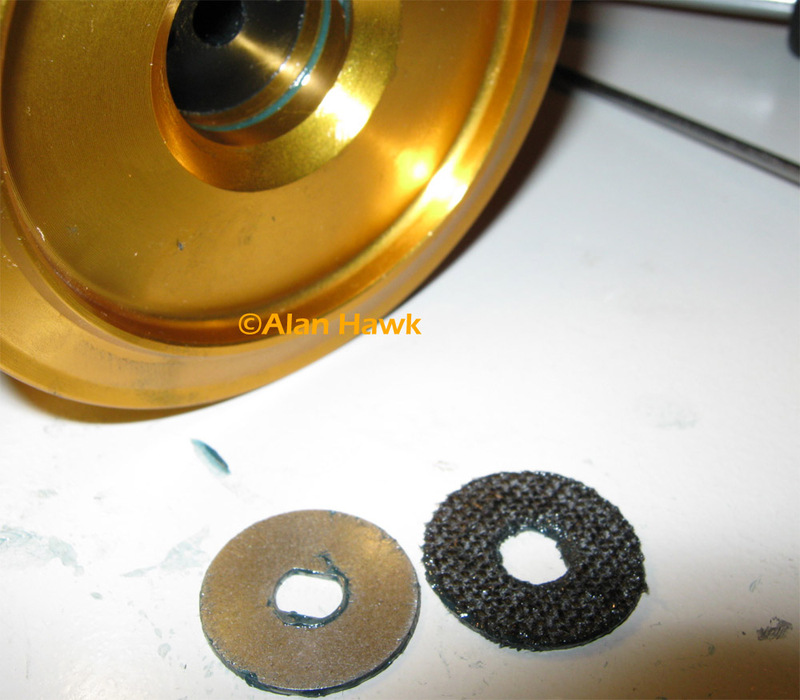 The threads of the brass pinion failed under pressure and in the above photo you can see the broken metal between the threads and on the right side of the photo you can see how the edges of the teeth were been broken off and flattened. That’s one of the most extreme failures that I’ve seen on a reel. I don’t know what else to say, so I’ll just move on. Right behind the rotor is the mechanical backup anti-reverse. 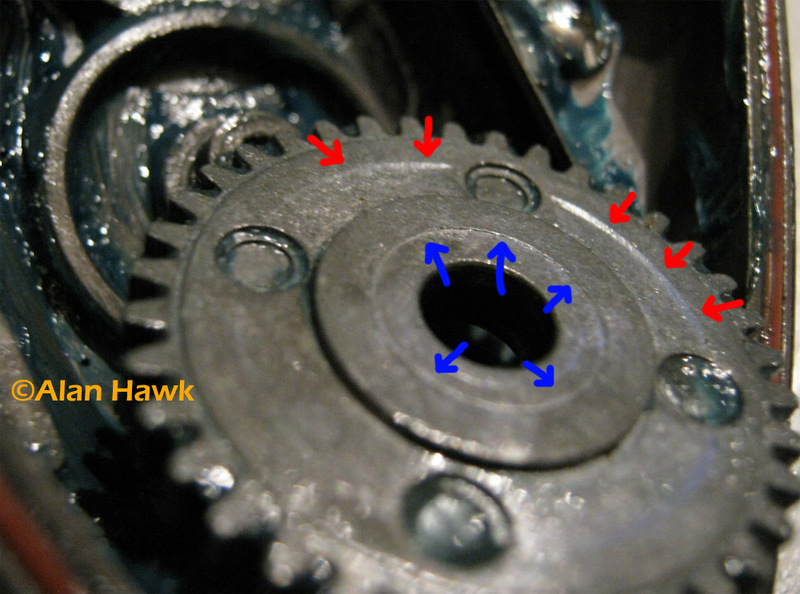 The dog (blue arrow) is pushed away as long as the pinion spins in the correct direction, but if the one way clutch fails and the rotor began turning backward, the dog would engage the teeth (red arrow) cast in the back of the rotor. This feature is on reels size 7500 up only. I was amazed by how powerful the rotor brake was. 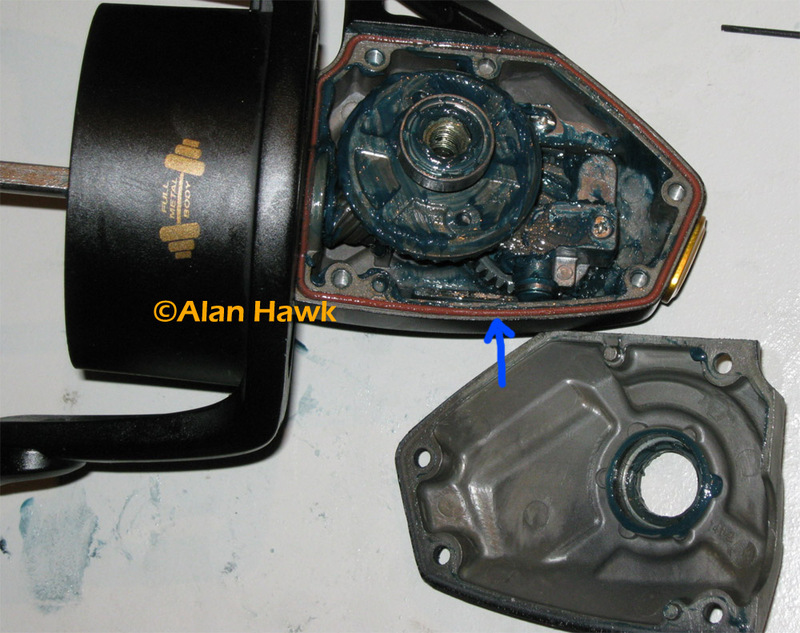 When you open the bail to make a cast the brake engages and the rotor will not move no matter how hard you swing. The part responsible for that is the brake ring (red X). Of course now I know that the brake stopped working earlier because the rotor was tilting, not because of a problem with the brake ring. 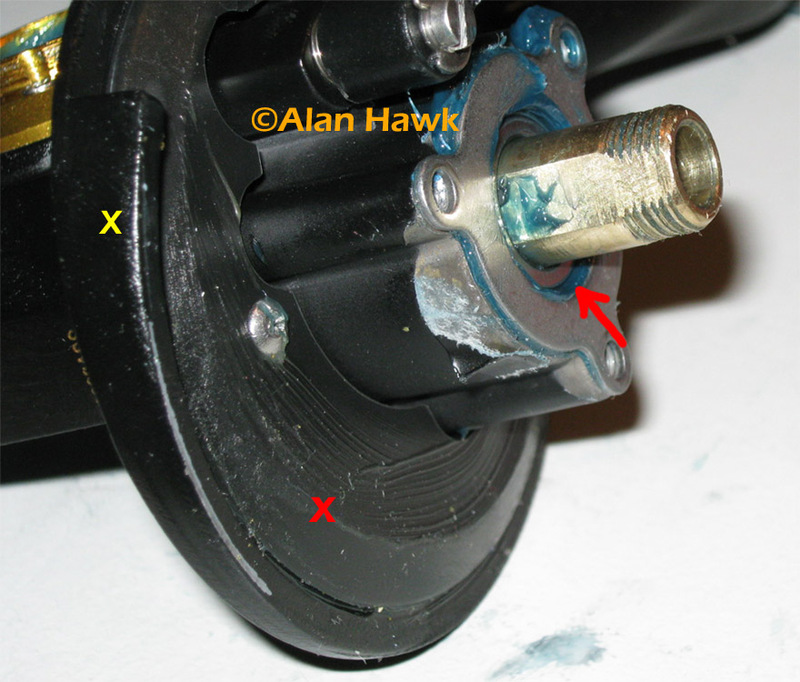 The red arrow in the photo above points the pinion assembly absence any sealing, and the yellow X marks the auto bail trip rail which is an integral pat of the fame and can’t be removed. This is not an optimal design. 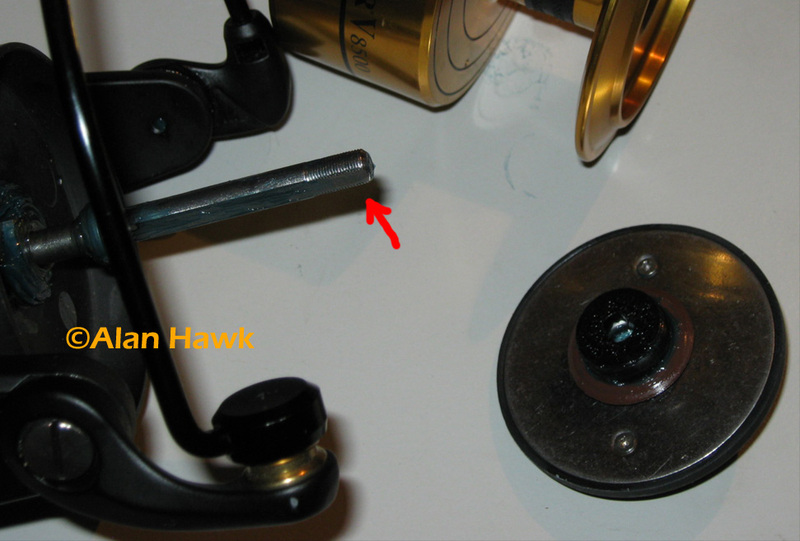 The rotor brake is VERY powerful, so closing the bail by turning the handle requires a lot of force and that puts undue stress on the gears and the handle threads. 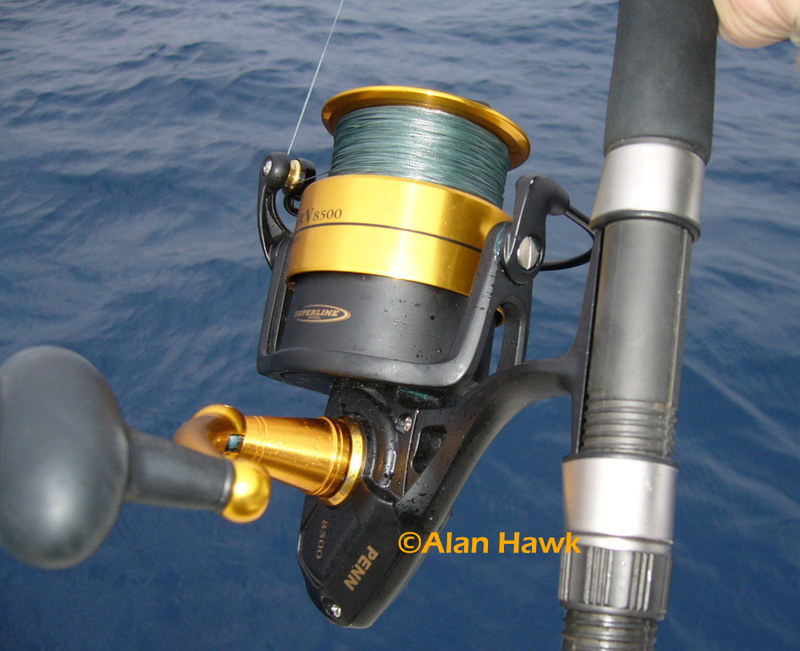 You don’t put an auto-trip in a reel that has such a strong rotor brake. I have some future plans to modifying the reel and upgrading parts when I have time, and one of the things I’ll do will be filing off that rail. Being strapped to the gunnel of a speedboat that didn’t have a rod holder. Granted there was a lot of spray, but that shouldn’t be a problem for a reel whose maker says that it can be “dunked in the surf”. It’s cast Zinc alloy, but I never draw conclusions about a gear’s performance based on materials. Only real life fishing and use shows what’s good and what’s not. As seen in the photo above the teeth show wear across the area of the tooth that gets the most contact with the pinion. There is no chipping or dents or scuffs, just clean wear. The wear rate is alright but not special. Relative to the use it’s been through I’d say that the gear wears about the same as the gear of the discontinued Slammer. There is nothing scientific about this and it’s just my personal evaluation based on observations of the reels that I’ve used over the years, so take it for what it’s worth. 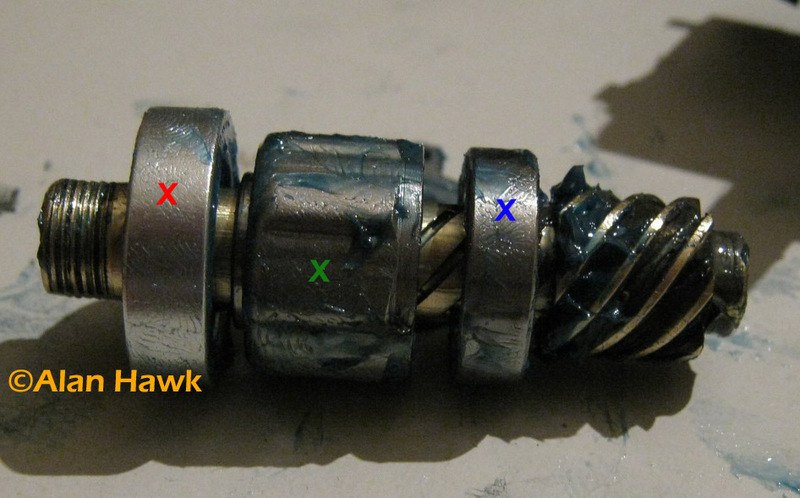 The pinion rides on two ball bearings, one directly (blue X) and one inside a collar (red X), and between them is the anti-reverse clutch (green X). Closeup on the clutch, pretty basic but it works fine. It squeaks a lot though and oiling it makes the noise go for a while but it comes back. 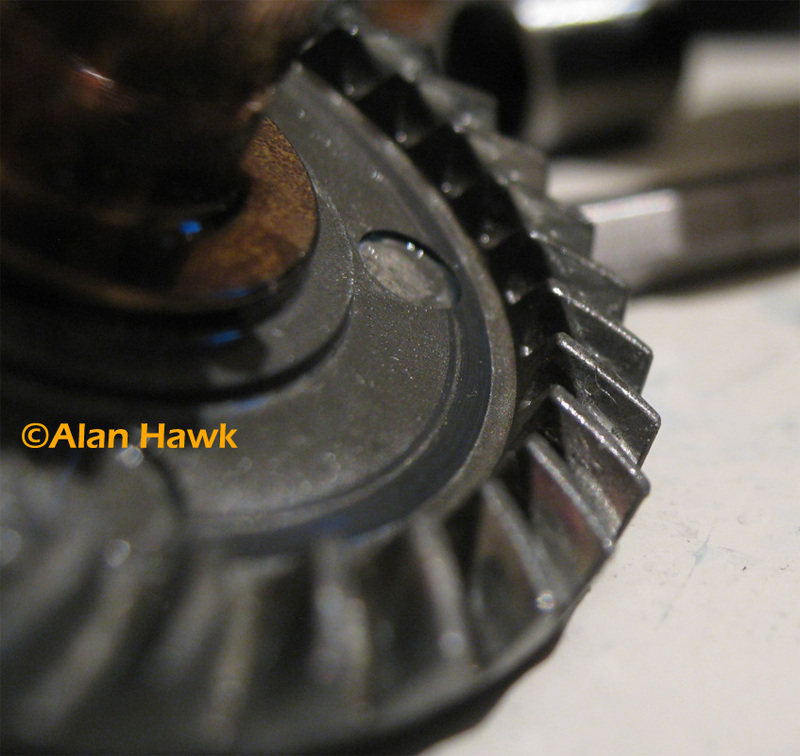 The pinion teeth show wear as well, but the drive gear was the sacrificial one taking most of the wear. You do feel the play in the handle minutely increasing with use. 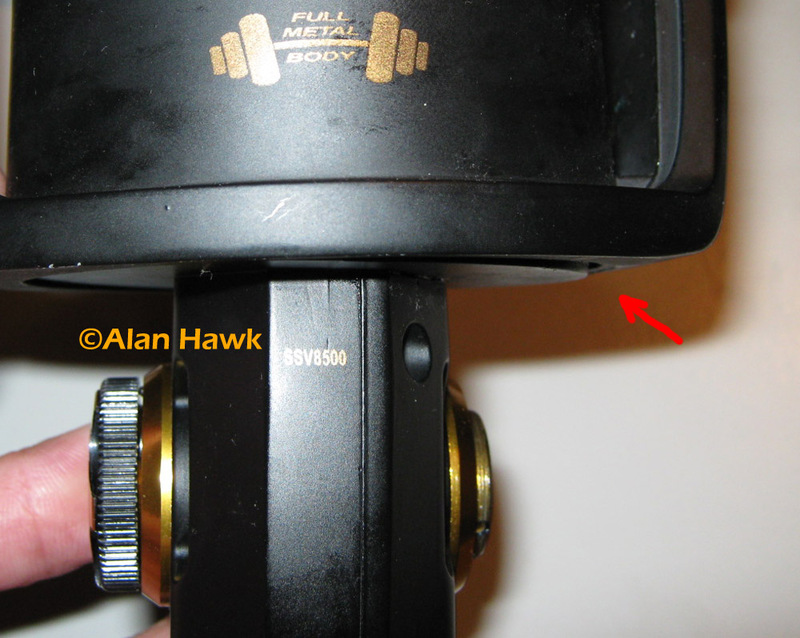 The traverse block has a metal roller on it’s side (red arrow) for a low friciton operation under load. 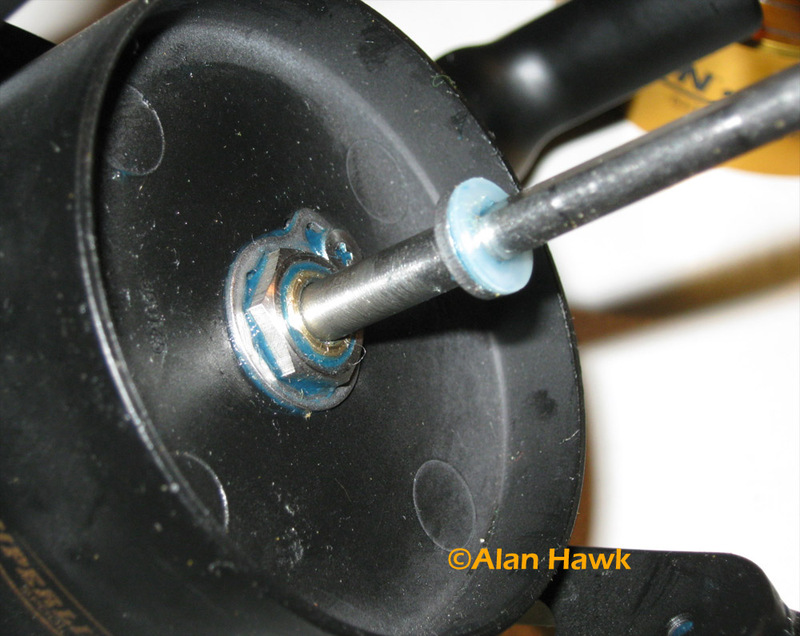 The roller on my reel was not turning, and it felt rough when I rotated it with my fingers. I don’t know if it came like that or stopped working with use, but it’s not a big deal anyway since the static roller is still very smooth and slides on the rail without rubbing. 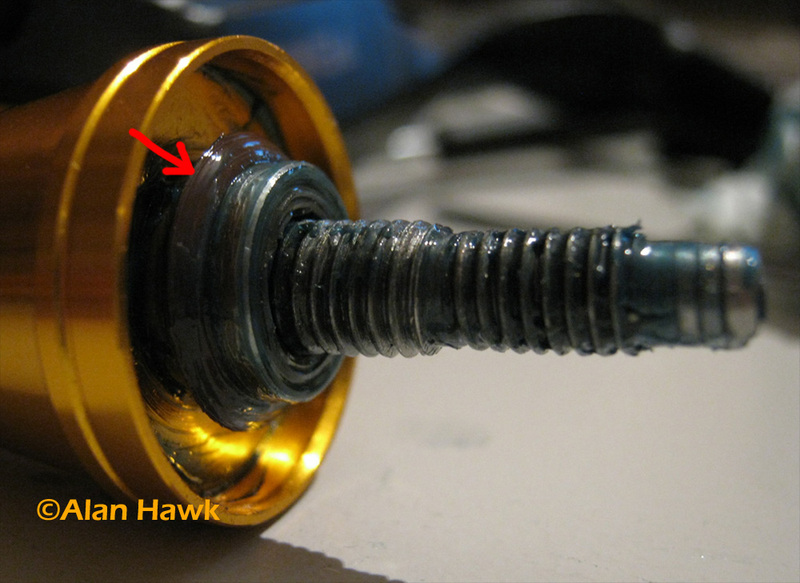 The gear rubs against the body and its back shows rubbing marks caused by the outer gear hub (red arrows), and a slight recess that has been dug by the friction with the base of the inner hub (blue arrows). All this added friciton contributes to the gradual loss of smoothness, which wasn’t good to begin with. And finally, the line roller. 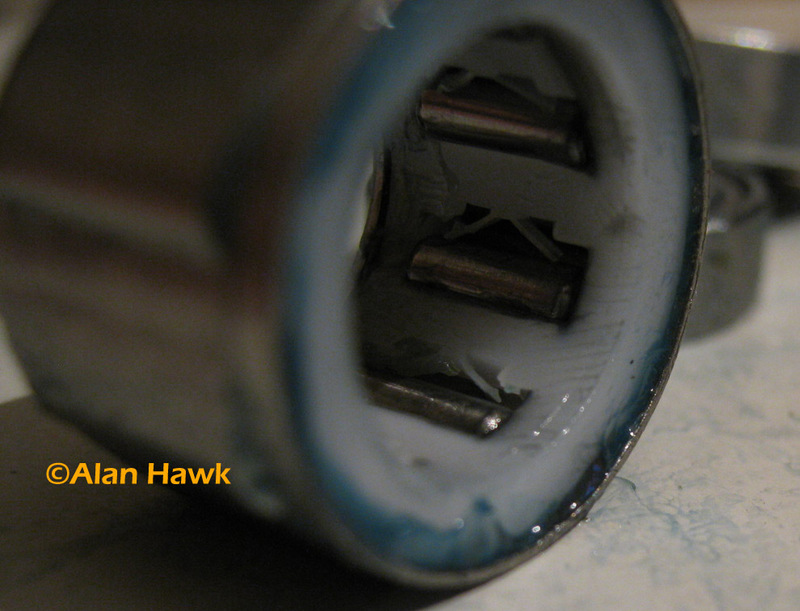 It runs on a ball bearing of a good quality and gave no problems whatsoever. Obviously the reel disappointed me on more than one level. 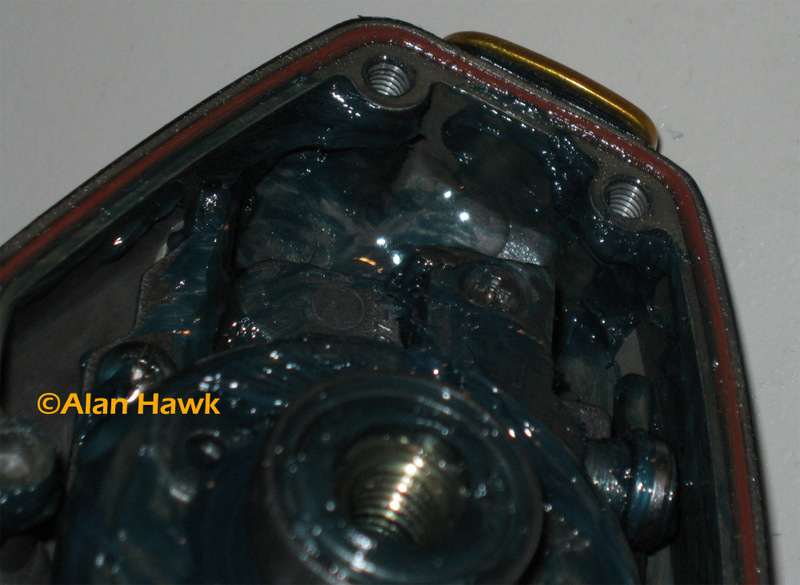 It can’t be water tight when there is an open passage for water through the pinion assembly and to a lesser degree around the main shaft, both having no seals, and the parts are not strong enough to handle the advertised drag rating. Fishing companies make rubbish claims all the time and virtually everyone is guilty; Shimano claim that the Sustain FG and Stradic FJ have a “floating shaft” when in fact they don’t, ZB publish grossly reduced weights for their reels, and Daiwa make all kinds of rubbish claims about the properties of their alloys and composites. I think Penn got carried away as well and exaggerated the reel’s capabilities. The Spinfisher V is made to a price point and wishing that they would upgrade the gears and add seals and bearings would be unrealistic, so it’s much simpler to see it for what it really is; a beefed up Slammer that is water resistant and has a few nice upgrades such as the rock solid casting brake, brilliant drag, a top notch line lay, and a finish that stood well to my abuse including hooking jigs on the stem.